We were fortunate to be touring temples in Ubud, Bali during a holiday based around the full moon (though the celebration only happens either twice per year, or once every seven months…we keep getting conflicting information). The temples were packed with locals, the women dressed in brightly colored silks while the men wore crisp white shirts and patterned sarongs. 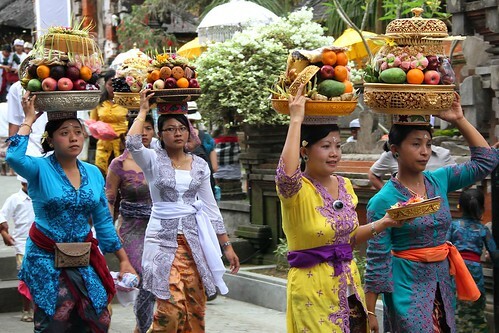 We hung around on the sidelines and watched dozens of women parade by, carrying the offerings – gigantic platters of fruits, roasted duck, and sweets – on their heads. It was pretty awesome, we’ve never seen anything like it so we were totally mesmerized. The colors, the clothes, the food and the traditions…..nothing you could get out of a book….had to be awesome…..it was a great time for you two to be there watching the tradition of their culture! We took some video to try and capture the whole scene with the music and the dancing as well. Even that doesn’t really do justice to how many people were there and all the smells and sounds…it was spectacular! We head to Australia in a week 🙂 I would definitely be careful about where you travel in the Mid East right now, though keep in mind that lots of conflict is in certain pockets. If you could get in touch with other travelers and see how they are doing in those places you might have a more realistic vision of what to expect. When do you go to Africa? Ooops, I meant “be going” not “being going.” 🙂 We aren’t doing a whole lot of the Middle East right now – some more of Turkey and then Georgia, possibly Armenia, and then Dubai. We spend 10 days in Cairo on Nov. 18-28 to work on getting our Sudan Visa. 😛 Our Africa tour begins in Cairo on Nov. 28 and ends in South Africa on March 23rd. I’m nervous but excited! Will you guys be going to NZ, too?